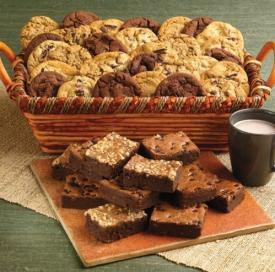 Because of some homemade cookies, brownies and pies, this world got a whole lot smaller and love got a whole lot bigger. Within an hour, we had a tent, two tables, a nice autumn table runner, pumpkins, platters and tons of cookies, pies, brownies, and muffins all set up. The early fall sun was bright with no clouds in sight. We rushed to meticulously categorize each goodie and display them on cake stands and in baskets tied with orange ribbons. Saylor slipped on her pink chef’s hat. Next to the sidewalk we hammered her “bake sale” sign into the grass. Once set up, we all plopped down into our camp chairs to wait for the swarm of traffic that would surely come. 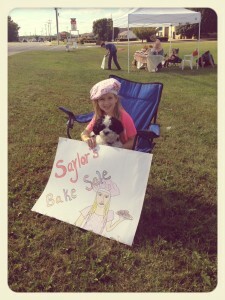 Saylor had decided she wanted to have a bake sale simply because it sounded like fun. The thought of actually raising money hadn’t really even entered her mind at first, but when it did, she decided that her bake sale earnings should go to help rescued dogs and cats at the local Humane Society. A simple idea of a child might be just that, and at the very same time, be essential to fulfilling something much bigger. And… we waited. Saylor stood out by her metal sign and waved as big as she could to passersby. They waved back and sometimes even honked, but then kept driving. She waved her hand-colored poster board sign high over her head to the hundreds of people in this small town as they smiled and moved through their Saturday plans. The sun was getting hotter by the hour. Her hands and arms were starting to hurt. Finally some friends came by, and then came a few more. They were wonderful, buying more than their sweet tooth craved and handing Saylor more money than they owed. Her jar began to fill up, slowly but surely. We took pictures of her very valued customers and shared them online, hoping to appeal to others. After talking for a bit with friends, we went back to waiting. “Mama I’m so tired. We’ve been out here so long. It’s hot and no one’s stopping.” She said after the first two hours, as she melted into the camp chair behind her table to take a break. “We told everyone that we’d be here from one to four and we have to keep our word.” I explained. The chocolate in the cookies was starting to melt. The blustery breeze blew over her stuffed scarecrow. Saylor moved her chair out by the sidewalk and held her sign in front of her face because her smile had faded. What at first seemed like so much fun, had become way too hard; in fact, she wasn’t sure she even cared about raising money anymore. She wanted to quit but she still had another hour and a half to go. A few more friends dropped in, including the editor from the local online newspaper, who took her picture, handed Saylor a twenty-dollar bill and asked that she just fill up one of her small paper sacks with a few goodies. Her smile returned and we finished out the afternoon with a fairly full donation jar and only two small baskets of goodies left, which she and her cousins gladly took care of. The final count at 4pm was $128.00. She was tired, hot, relieved, content, and just ready to go inside. A couple of days later, Saylor was giddy when she walked proudly into the local Humane Society and handed the manager a check for $256.00. 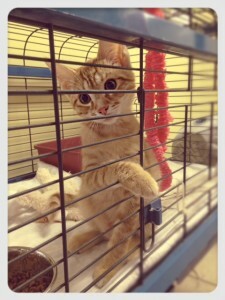 He said her timing was perfect because they were extremely low on cat litter and were nearly out of funds. You see, even though we had put a time limit on this project, it turns out that the story did not end at 4pm that Saturday afternoon. Even though the sun was blaring and hot, so many people didn’t stop, her arms ached from holding her sign, and her chef’s hat was itchy, God was smiling down at Saylor like a Daddy does when He knows how the movie is going to end. Anna is his granddaughter and she had a challenge of her own throughout her four years on earth. It was called Rhett Syndrome. By the world’s view, that fight was lost, but only winners get wings and on September 5th 2012, Anna got hers. I know that when love is moved from one heart to another and to another that in God’s infinite vision, far beyond these silly things called space and time, her story, too, is not over; it is just beginning. give away as much love as you can as often as you can.